We saw The Gambler, and the opening scene had Mark Wahlberg talking to his hospitalized grandfather. 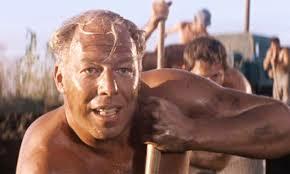 As soon as the grandfather spoke, I knew it was George Kennedy, who has one of those voices that stands out. This was his only scene, but it was one of my favorites. In honor of seeing George Kennedy in The Gambler and realizing that he is still with us, here is some wisdom that can be found in his movies. All men lose when they die, and all men die. We must remain true to ourselves. A good body with a dull brain is as cheap as life itself. All battles are fought by scared men who’d rather be someplace else. Insurance companies move in mysterious ways. Sometimes nothin’ can be a real cool hand. You call the tune, and you pay the piper. A man has got a right to change his mind. Yep, there is some wisdom in George Kennedy’s movies. It is probably too soon for another edition of Movie Wisdom, but I have been inspired by one of my favorite movies, which is on television at this very moment. El Dorado stars John Wayne, James Caan, Robert Mitchum and a ton of character actors. One of those actors is Robert Mitchum’s brother, John. John Mitchum was never a leading man like his brother, but he was in a bunch of good movies. In honor of finding this gem deep in the heart of my satellite dish, this is the Movie Wisdom that can be found in the movies of John Mitchum. Just because they are dumb doesn’t mean that they’re stupid. The French don’t care what they do actually, as long as they pronounce it properly. There even are places where English completely disappears; in America they haven’t used it for years. Women are irrational, that’s all there is to that! Next time you shoot somebody, don’t go near ’em till you’re… sure they’re dead! Faith can move mountains, but it can’t beat a faster draw. Because no matter where people go, sooner or later there’s the law. And sooner or later they find God’s already been there. We may have to be neighbors, but I don’t have to be neighborly. It’s what people know about themselves inside that makes ’em afraid. They say the dead don’t rest without a marker of some kind. A man’s got to know his limitations. Dyin’ ain’t much of a livin’. Now remember, when things look bad and it looks like you’re not gonna make it, then you gotta get mean. Without a doubt, those are wise words. I have been reading about the Rat Pack and the exploits of its members – Frank Sinatra, Dean Martin, Sammy Davis, Jr., Peter Lawford and Joey Bishop. Together, they were legendary. However, I have been thinking about their individual careers. Obviously, Frank Sinatra is one of the most famous performers of all time. Sammy Davis, Jr. also had a great career. Peter Lawford is probably best known as a Kennedy in-law. I’m not sure what else Joey Bishop did. Dean Martin, though, is my favorite. He sang great songs and made great movies. Some of the best movies were Westerns. For a cool crooner, Martin was pretty handy on a horse and with a gun. 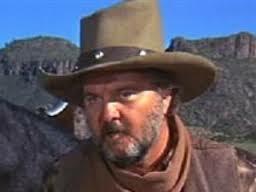 In my mind, his best Western was Rio Bravo, starring John Wayne, Ricky Nelson and Walter Brennan. Here’s a trivia question. How many people in Rio Bravo had records that reached Number 1? The movie is about a sheriff who has arrested the brother of a wealthy rancher. He and his deputies have to fight to keep him in jail and to stay alive. Martin plays Dude, a deputy who doubles as the town drunk. 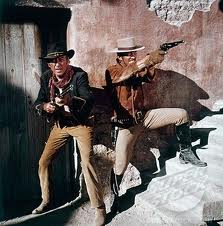 Another great thing, Rio Bravo was filmed at Old Tucson Studios, one of my favorite places to visit. 5 Card Stud is another good one. Martin plays Van Morgan, a gambler who has to solve a series of murders before he becomes the next victim. Everyone who is killed was playing in the same card game. It also stars Robert Mitchum and Inger Stevens but suffers from what I call the “law of diminishing suspects”. There are so few suspects that solving the mystery is too easy. Bandolero! 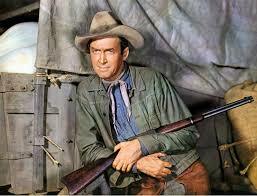 pairs Martin with James Stewart as brothers who have taken different paths but find themselves in trouble together. Along the way, they take Raquel Welch hostage. 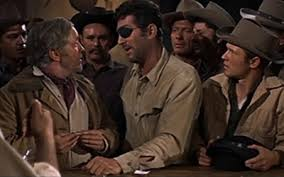 My least favorite Dean Martin Western is The Sons of Katie Elder. It stars John Wayne and has the makings of a great story, but the “sons” are mismatched. The youngest “son” is way too young to play the part. 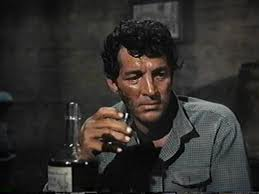 I hate to say that a Western starring John Wayne and Dean Martin is bad, so I will say that it’s not very good. Martin is the gambling brother, Tom Elder, and he follows older brother John in trying to figure out who killed their father. One of the best scenes has Martin playing a “fake eye” trick in a bar. 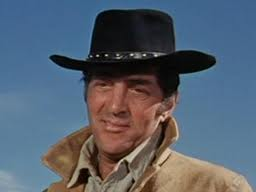 Dean Martin made other Westerns, but these are the ones I have seen. Honestly, I don’t think I could make it through the comedy ones with Frank Sinatra.